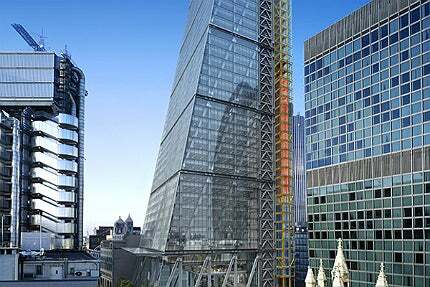 The Leadenhall Building in the City of London is designed by Rogers Stirk Harbour + Partners. Image courtesy of The Leadenhall Development Company Ltd. The 802ft-high Leadenhall Building features a tapering form. Image courtesy of The Leadenhall Development Company Ltd. The construction of the 50-storey building was started in 2011. Image courtesy of The Leadenhall Development Company Ltd. The Leadenhall Building, jointly owned by British Land and Oxford Properties, offers 610,000 square feet of office space across 47 floors. Image courtesy of The Leadenhall Development Company Ltd. The Leadenhall Building project was completed in 2014. Image courtesy of The Leadenhall Development Company Ltd. The Leadenhall Building is an 802ft (224.5m)-high office tower designed by architecture firm Rogers Stirk Harbour + Partners. The office tower, located opposite Lloyd’s in the City of London, is the tallest office space in the immediate area. The iconic 50-storey building was jointly developed by two real estate companies, British Land and Oxford Properties. Construction of the Leadenhall Building started in 2011 and was completed in August 2014. Leadenhall Building has been erected in the heart of the City of London over an area of 3,500m². The site is surrounded by other tall buildings in the city. The construction site had a 12-storey office building built in the 1960s, which was demolished to build the new tower. The site offers good transport connectivity. It provides easy access to underground stations at Bank, Liverpool Street, Aldgate and Moorgate. It is located in close proximity to major commuter hubs, including Liverpool Street, Fenchurch Street, Cannon Street and London Bridge. The site also provides quick connections to all London airports including Heathrow Airport. "Leadenhall Building has been erected in the heart of the City of London over an area of 3,500m²." The Leadenhall Building design features a tapering shape in order to protect the sight of the nearby St Paul’s Cathedral dome. The building structure, when viewed from the west, appears to be inclined away from the Cathedral. The rectangular floor plates of the building shrink in size as the building height increases. The floor plate size ranges from 16,000ft² on the lower floors to 6,000ft² on the top floor. The high-rise office tower has an external braced tube structure rendering lateral stability rather than the traditional central concrete core. The building is designed to have a transparent envelope with its structural steelwork visible from the outside. The building features a seven-storey landscaped open Galleria space of approximately half an acre at its base, providing lawns, seating, trees, retail units and exhibition spaces for public. The main reception of the building is accessed by escalators from the Galleria space. The circulation and servicing core of the office building housing passenger and goods lifts is located in a separate north-facing tower at the rear of the building. The building provides 610,000ft² of office space over 47 floors. As of April 2015, 72% of the office space in the building is let. International insurance company Aon shifted its global headquarters from Chicago to the Leadenhall Building. It occupies an area of 191,000ft² from level four to 13 of the building. Another insurance company, Amlin, occupies 111,000ft² of space on levels 18-24 as well as level 45. The construction of the building involved 18,000t of steel and 70,000m² of cladding. "The iconic 50-storey building was jointly developed by two real estate companies, British Land and Oxford Properties." Most of the structural and architectural components, including solid concrete floors, were manufactured off site and then delivered and assembled on site, which accounts for around 85% of the total construction cost. The columns and beams of the perimeter tube frame are connected together by nodes and all the joints of the external frame are connected with the use of pre-stressed bolts made of steel rods with up to 76mm diameter. The construction of the building was 50% complete in November 2012. The topping out of the building occurred in June 2013. The building features a sustainable design with office areas protected from solar radiation with the use of solar responsive venetian blinds fitted in the cavity of the double layer glass facade on the east, south and west sides of the building. Water consumption is minimised through low-flow water fixtures and fittings. The building also uses energy and water metering system for efficient management of water and energy consumption. The building construction produced almost zero waste since most of the components were designed and manufactured offsite. Laing O’Rourke was the project’s main contractor. Arup provided structural and service engineering services. Project management services were provided by M3 Consulting. DP9 was involved as the planning consultant. Davis Langdon worked as the quantity surveyor. Lift engineering services were provided by Kone. Warrington Fire Research was engaged as the fire consultant. Edco Design London was responsible for the landscape architecture of the building. The Roca London Gallery located at Imperial Wharf near King’s Road in the Chelsea Harbour district, London, was opened in October 2011. London Aquatic Centre, constructed in the London Olympic Park, is a speciality facility that will host athletics during the 2012 Olympic Games.